Home Featured Articles Can Humans Achieve Immortality? Since time immemorial the question has been asked: Can humans achieve immortality? Some claim that human immortality is a scientific reality. 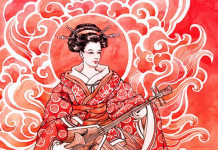 Realized souls from different spiritual traditions teach us how we can achieve immortality. Amrita Vani will give answers to those who want to become immortal. Everyone wants to live eternally. Hiranyakashipu wanted to become immortal in this world. But even after conquering all three worlds, he failed. In the story of Churning the Milk Ocean demigods become immortal in the sense that they gain extraordinary longevity, but they do not become literally immortal. Materialists nowadays have even gone so far as to deep freeze their dead bodies immediately after death, to preserve their body. They hope that in future some new technology will surface which can revitalize their bodies again so that they may continue to live. Since the body is not meant to live eternally, these attempts will surely fail. Of course, it will be never possible to escape death. So can humans achieve immortality at all? The following article deals with the process on how to become immortal. How do we find a genuine spiritual master? The first step in attaining perfection is to take shelter of a bona fide spiritual master. By the Lord’s will, everyone receives a spiritual master according to his qualification, just as the Christians received Jesus Christ and the Muslims Prophet Mohammad. Moreover, according to their misfortune, materialists remain attached to material life by accepting family priests as their spiritual masters. But if we are fortunate and search sincerely for a bona fide spiritual master, and if we humbly pray to the Lord to attain the mercy of such a guru, then by the Lord’s mercy we will certainly receive a bona fide guru in this lifetime. Out of many millions of wandering living entities, one who is very fortunate, by the grace of Krishna, gets an opportunity to associate with a bona fide spiritual master. When a living entity sincerely and humbly prays in this way, then the most merciful Lord appears before him in the form of a liberated devotee. 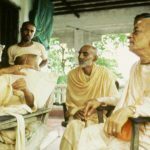 Unless we are fortunate enough to receive transcendental knowledge from a bona fide spiritual master, we cannot become qualified to engage in the Lord’s service. Since no human being or demigod is capable of awarding such transcendental knowledge, we must find shelter under a bona fide spiritual master. Can humans achieve immortality if they reject their benevolent well-wisher, the bona fide spiritual master? 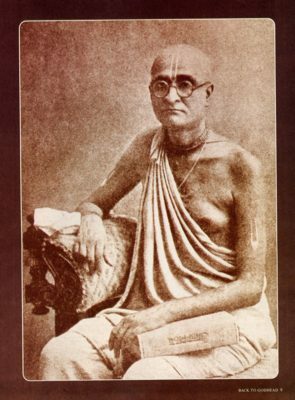 The spiritual master comes from Vaikuntha. The Lord has sent him. How can humans achieve immortality and go back to Godhead if they renounce his shelter and association? The spiritual master’s mercy is the root of all auspiciousness. What have we actually done to receive his mercy? We should renounce our false ego and offer our respectful obeisance at his feet. To give up the false ego that “I am the seer” or “I am the enjoyer,” is called offering obeisance. That is why the word “namaḥ,” obeisance, is added to mantras. It is everyone’s duty to worship the self-realized spiritual master and follow in his footsteps. We should not follow the blind. The spiritual master is our only well-wisher; our only relative, and our only protector. Only by his mercy can humans achieve immortality and be fortunate enough to know this. 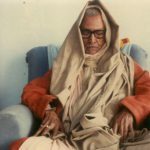 After attaining the lotus feet of my spiritual master, I no longer maintained the mentality that aside of his service I have important things to do. My spiritual master, who is the Lord’s dear-most servant, mercifully imparted to me knowledge of Nandanandana’s service to protect me from false ego. Thus, I realized that the living entities have no duty other than to gratify Krishna’s senses. Nandanandana is the only worshipable Lord, the life, soul and ornament of all living entities. The spiritual master is extremely dear to that Nandanandana. An unqualified person such as myself cannot serve such a spiritual master with body, mind, and speech. Yet my spiritual master, who is an ocean of mercy and affection, empowered me out of his causeless mercy and treated me with an abundance of love. He is so merciful! If I can attain his mercy, if I can realize that beside him I have no other well-wisher in this world. Then, simply by his causeless mercy, I will be able to attain the qualification to serve him who is pleased by sincere service. On the day he bestows his causeless mercy on me and becomes pleased with me I will properly understand hari-kathā. Then nothing other than the service of guru and Krishna will remain important to me. We should always pray to the spiritual master to become qualified to accept his causeless mercy and empowerment. The spiritual master’s mercy incomparable. Due to misfortune I cannot realise the greatness of my spiritual master. The Supreme Personality of Godhead, Krishna, is controlled by devotion, still, I am unable to show gratitude for the causeless mercy He has bestowed by appearing before me as guru. What mentality should a sincere disciple have? Sincere disciples should be completely devoted to their guru. They should know their spiritual master to be as good as God, the only object of their love and devotion. 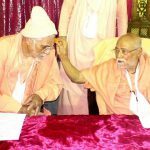 “The spiritual master is my eternal master and I am his eternal servant”: this is how a disciple thinks. Service to the spiritual master is a disciple’s life, ornament, and means of survival. Disciples do not know anything except their spiritual master. They always think of their spiritual master while eating, sleeping, dreaming, and serving. 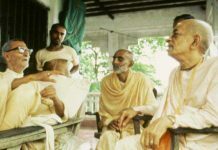 They are fully convinced that the spiritual master is the completely independent Personality of Godhead. A sincere disciple has the following mentality: “Even if my spiritual master does not accept service from such an unqualified person as myself, I will always be prepared to render unalloyed service at his feet with body, mind, and words. If he kicks me, I will think it is because of my incompetence; his kick will come because of my faults. Whose offering does Lord Krishna accept? “O Krishna! I do not want from You any happiness for myself. Whatever You want from me, I will obey without fail. Even if I have to suffer in executing Your will, that suffering will be my pleasure. 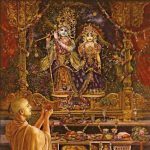 You are the all-auspicious Lord, and as such, Your arrangements can never be inauspicious.” If a servant of Krishna feelingly prays to Him with such faith, the Lord will certainly accept his offering. Without these feelings and faith, the Lord will not accept that which is offered. 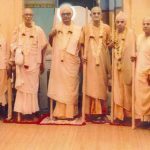 How should a devotee pray? How should we call the Supreme Lord? 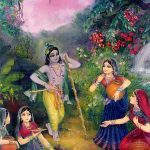 Sri Gaurasundara taught us that in order to chant the Lord’s holy names, we must become lower than the straw in the street. Unless we consider ourselves insignificant, we cannot call upon another for help. Only when we pray for another’s help do we consider ourselves helpless. In such a state of mind we think that without another’s help we will be unable to do anything. We will understand that it is impossible to do alone that which is meant to be done by five people. An external display of humility is not necessarily genuine humility. More likely it is cheating. Our call will not reach the Lord if we call Him as a master calls his servants. He is supremely independent and not under anyone’s control. Unless we transform our false ego and become sincerely humble, our prayers will not reach the supreme, immortal, independent Lord. One more point: We have to remember that while humbly chanting the Lord’s name, if we do not become tolerant, our chanting will remain imperfect. If we display our intolerance by being greedy for particular objects, then we are opposing the principle of humility. If we have complete faith that the Supreme Lord is the Absolute Truth and that by simply chanting His names we will not experience any deficiency, we will have no lack of tolerance. As soon as we become greedy and try to exhibit our impatience or our own skill, we cannot call the Supreme Lord properly. We often think we are doing the Lord a favor by offering Him prayers; that we could have engaged in some other activity instead. Such a mentality is an example of a lack of tolerance. We need someone to protect us from such a mentality, someone to help us become lower than the straw in the street. What should be the object of our praying? The object of our constant prayer should be to beg the Lord for His causeless mercy. The final goal of every living entity is to attain kṛṣṇa-prema. 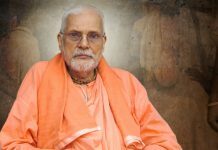 In order for us to overcome the repeated cycle of birth and death, we have to follow and surrender to a self-realized soul, who is completely surrendered to Krishna. Only by attaching ourselves to those who are dear to Krishna, can humans achieve immortality. So it is crucial that we associate and serve those, who have are not subjected to this repeated cycle of birth and death. So can humans achieve immortality? The answer is definitely yes!